After significant Googling, I achieved success: the Men’s Health website, of all places, had the recipe. Even better than the recipe itself is Men’s Health’s description of it as “seductive cooking”, along with an accompanying photo of a nameless blonde with chocolate smeared on her nose. Clearly, this is what we men fantasize about when thinking about working in a kitchen. A jar of chocolate sauce comes out, and things get out of control. Speaking of things getting out of control, to keep the cost of the dish from getting there, I substituted Cava for Champagne. If there are any benefits to being married, being able to use Cava instead of Champagne in your “Poached Lobster with Tarragon and Champagne” ought to be one of them. 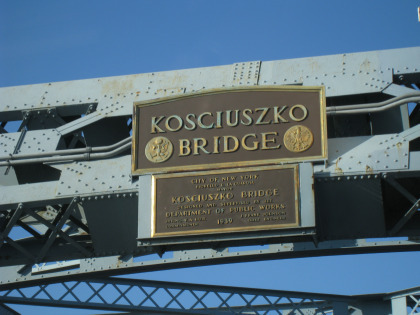 (American caviar instead of Russian is another.) I am doubting that either of us had the capability of noticing the difference, anyway. In cooking the lobsters, I figured I’d employ Ripert’s method of killing the lobsters in advance of boiling. It’s not like I’m Woody Allen in Annie Hall or anything, chasing and/or running away from lobsters in my kitchen, but I’ve always had mixed feelings about those few seconds a poor lobster has to bathe in the pot alive. Well, that, and the fact that we don’t have a pot big enough to fit a live lobster. Ripert’s technique, described in his Le Bernardin cookbook, entails sticking the point of a chef’s knife straight down through the center of the horizontal line closest to the head, then quickly chopping forward all the way through the head. This, according to Rippert, instantly kills the lobster (during which of the two cuts, I’m not sure) and the lobster will be dead, despite still twitching enough to fall off my counter and into my recycling bin. But the technique is easier than the first time I tried it, when I didn’t hold the knife straight up and down during the first cut, and I chopped, rather than stabbed straight through. Killing the lobsters in this way allowed me to remove their claws before cooking to fit two lobsters in the pot. I won’t repeat the recipe since you can read it yourself, but I’ll just mention that I love recipes like this because the gradual progress of the dish really instills in one a respect for the dish’s history. No one, Ripert included, invents a dish like this on the first try, but thanks to him and all the cooks that came before him, you can pull off an incredible dish on your first try. Whew. Got the lobster stock into the pan without spilling it. 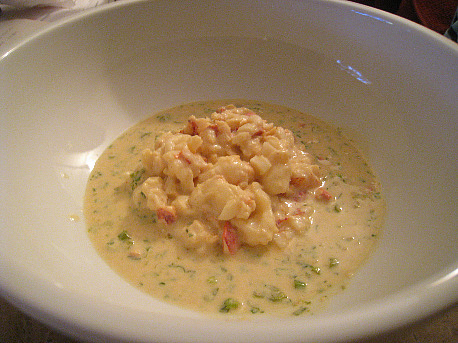 The key element of this entire dish involves cooking the lobster shells with the nage (the aromatic liquid you initially boil, technically poach, the lobster in), along with the expensive French and/or cheap Spanish bubbly wine, until you’re left with a mere 1/2 cup of liquid. 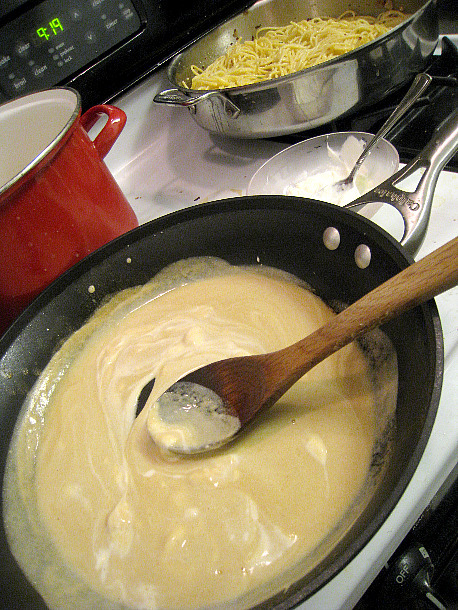 That liquid, by the time you’re done, is worth its weight in gold, so until I got it into a pan to finish the sauce, I knew disaster was possible at any moment. Alas, all was well. I gradually stirred in the fat-free sour cream, and then the herbs. 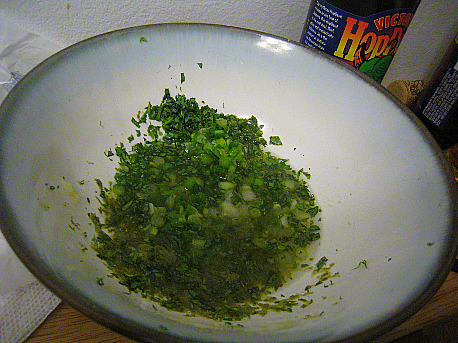 Green onions, tarragon, lime juice and lime zest. Just what I would add to a lobster sauce if I were a four-star chef. My inspiration for the evening’s meal came from my desire for pasta, a recent dish we had made, and George Costanza’s well-known adage to do the opposite. 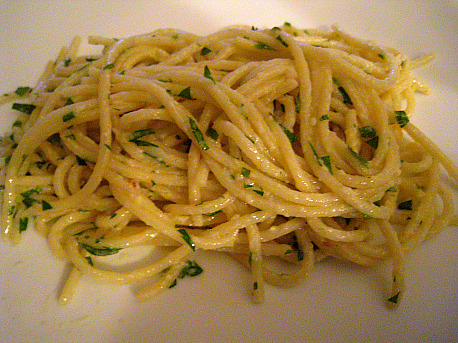 The dish was drunken spaghetti, in which you may remember is spaghetti cooked in a pot of salter water and red wine, in equal parts, then finished in pan with olive oil, butter, sauteed garlic, a splash of more wine, some chopped parsley, and a handful of Pecorino Romano. And no, I didn’t try to identify the opposite of pasta, just the opposite of red wine. My new invention, made with scotch whiskey and spaghetti… just kidding, but I think I had you there for a second… made with white wine and spaghetti, was a perfect pairing to a lobster with champagne. Spaghetti for the late summer afternoon wino. Another thing I loved about this dish is that the lobster is sitting in a bowl, cooked nearly but not quite all the way, just waiting for you to finish it by poaching it in the sauce just prior to the herbs going in. I.e., there’s no last-minute panic that some dishes involve. The spaghetti is done and waiting for you, and you can complete the lobster and serve. The intensity of the lobster liquid is so strong that it easily permeates the sour cream, and the fresh lime and herbs at the end add the perfect tang and freshness. Perhaps the most impressive thing about this “romantic” and “seductive” recipe is its claim to serve four people. For some reason, I never would have thought that such couples would have needed to be romanced and seduced; I thought the two couples just sort of met up and got right to it. I guess that’s just how their lobster rolls. * Yes, an entire blog post leading up to one, painful “lobster rolls” joke. Guess who’s laughing now?